What is DWG FastView Plus? DWG FastView Plus is a lightweight and cost-efficient DWG file viewing and drawing software. An economical alternative to AutoCAD, it delivers familiar functions in an intuitive interface. the latter is especially beneficial to individuals and groups who are watching their overhead costs. As it is easy-to-use, there is no need for a prolonged familiarization period or for training sessions. This means that you can gain your ROI the moment you start utilizing the software for your needs. DWG FastView Plus also gives you the ability to collaborate seamlessly with your associates. You can share your drawings through email without fear of interception, as the contents are encrypted and can be unlocked only by a password. DWG FastView Plus is your economical alternative to AutoCAD. It offers you a broad range of tools and functionalities without making a dent in your budget. With this, you can reduce your overhead costs and focus your attention towards growing your business instead. DWG FastView Plus is a lightweight application though it is replete with advanced features. This means that when you open DWG and DXF files, you can expect to see its contents immediately. On top of that, the software remains highly responsive even when working with large drawings, letting you save precious seconds. DWG FastView Plus is equipped with tools that allow you to modify and apply measurements and dimensions. These let you better communicate the ideas you envision with your team mates as well as with your clients. As such, the designing process can progress smoothly and finish faster, thus affording you more time to spend on other projects. If your collaborators are remote, you need to share drawing files with them securely to protect your business interests. The people behind the DWG FastView Plus understand that which is why the software gives you the capability to encrypt your drawings and send them as secure attachments via email. What Problems Will DWG FastView Plus Solve? Not every member of your team needs to learn how to draw, thus a high-tier CAD software may not be necessary for your company. With DWG FastView Plus, you have the essential tools you need for viewing and modifying DWG and DXF files. Thus, the software is a lightweight one and can open large files in a matter of seconds. Since Autodesk has changed its licensing policies, many firms have been looking for a more economical alternative to AutoCAD. DWG FastView Plus is one such, as it requires only an affordable, one-time fee. On top of that, its interface is familiar to previous AutoCAD users, thus companies need not hold training sessions. Most users complete their tasks by comparing drawings. To that end, DWG FastView Plus provides them with easy-to-use tools such as Drawing Compare to highlight differences between drawings that they can utilize with ease on the spot, especially when they are on construction sites. 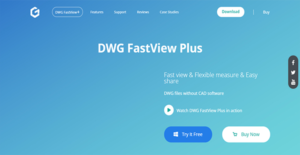 If you are interested in DWG FastView Plus it might also be beneficial to check out other subcategories of Best CAD Software collected in our base of SaaS software reviews. It's crucial to note that almost no software in the CAD Software category will be a perfect solution able to meet all the requirements of various business types, sizes and industries. It may be a good idea to read a few DWG FastView Plus reviews first as certain services may perform well exclusively in a really narrow set of applications or be prepared with a really specific type of industry in mind. Others might operate with a goal of being simple and intuitive and therefore lack complex elements needed by more experienced users. You can also find services that focus on a wide group of customers and provide a rich feature base, however this frequently comes at a more expensive cost of such a software. Make sure you're aware of your requirements so that you purchase a solution that provides exactly the elements you look for. How Much Does DWG FastView Plus Cost? DWG FastView Plus has a simple and straightforward enterprise pricing. You can acquire a perpetual license for the software for only $49.00. We realize that when you make a decision to buy CAD Software it’s important not only to see how experts evaluate it in their reviews, but also to find out if the real people and companies that buy it are actually satisfied with the product. That’s why we’ve created our behavior-based Customer Satisfaction Algorithm™ that gathers customer reviews, comments and DWG FastView Plus reviews across a wide range of social media sites. The data is then presented in an easy to digest form showing how many people had positive and negative experience with DWG FastView Plus. With that information at hand you should be equipped to make an informed buying decision that you won’t regret. What are DWG FastView Plus pricing details? What integrations are available for DWG FastView Plus? DWG FastView Plus does not integrate with other software but it supports native AutoCAD 2018 drawing. If you need more information about DWG FastView Plus or you simply have a question let us know what you need and we’ll forward your request directly to the vendor.